Hanukkah & Thanksgiving collide -- time for some sweet potato latkes? Hanukkah's coinciding with Thanksgiving for the last time for, well, about 79,000 years. So you might not want to put off this special celebration. The D.C. Dreidel Championship at Sixth & I Historic Synagogue (600 I St. NW) features an open bar, live music and a latke bar with a master chef. 8 p.m.; free with RSVP. Move over, National Christmas Tree. 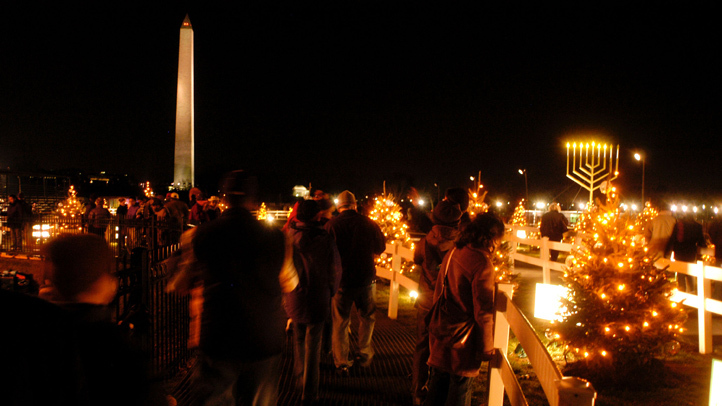 The National Ellipse (17th Street and Constitution Avenue NW) makes room for the festival of lights with the world's largest menorah, at the National Menorah Lighting Ceremony. Catch musical performances by the U.S. Air Force Band, the Three Cantors and Grammy Award-winning violinist Miri Ben-Ari. Tickets are free, but arrive early to score photo ops and snack on latkes and donuts. 3:15 p.m. gates; 4 p.m. event begins; free with ticket request. Mark the 7th night of Hanukkah with a Hanukkah Happy Hour on the Hill at three local bars this year, including a wine bar: the newly reopened Hawk and Dove (329 Pennsylvania Ave. SE), The Pour House (319 Pennsylvania Ave. SE) and Sonoma Restaurant and Wine Bar (223 Pennsylvania Ave. SE). You can also do some good while you drink. Donations of warm winter items like gloves, socks, scarves and hats will be collected to donate to D.C.'s homeless during the Dec. 25 Day of Service at the D.C. Jewish Community Center. 6-9 p.m.; $5 cover; tickets available online. Are all your Christian friends too busy to hang out Christmas Eve? Mix and mingle at the Society of Young Jewish Professionals' 25th Annual MatzoBall for a night of networking and matchmaking at Midtown D.C. (1219 Connecticut Ave. NW). 8 p.m.-3 a.m.; $30; tickets available online. At the Hands-On Chanukah Celebration, bring the little ones for a day or music, arts and crafts, face painting, story time and more at the Jewish Community Center of Northern Virginia (8900 Little Turnpike, Fairfax, Va.). 11a.m.-3 p.m; free. Join the Jewish Women's Entertainment and Lecture Series for their Chanukah Party and Candle Making event (4301 Seminary Road, Alexandria). Mingle with other women while nibbling on delicious Hanukkah refreshments as you listen to lessons from the ancient story of Hanukkah. Participate in a candle-making workshop, and don't forget to bring a gift for the women's gift exchange. 7:30p.m. ; $12. 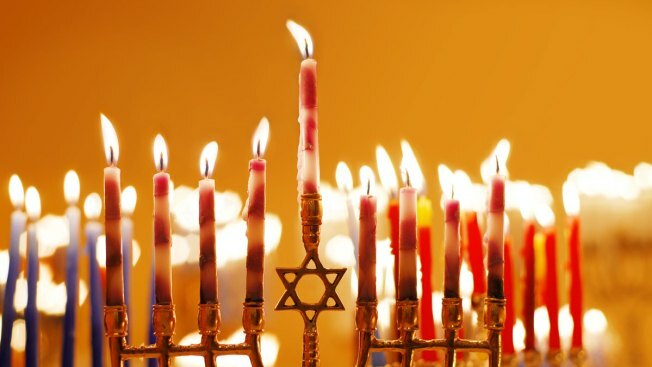 The Chanukah Festival at the Crowne Plaza Hotel (901 N. Fairfax St., Alexandria) features the lighting of a six-foot-tall menorah, a free raffle for a Nook HD tablet, live performances, a free glowstick for every child, chocolate, dreidels, and of course, latkes. 5 p.m.; free. Let the pets join in on the Hanukkah fun with Latkes & Leashes at Petsmart (218 Kentlands Blvd., Gaithersburg). Learn how to best care for your bests during cold weather. And (we should just be copy-and-pasting this phrase by this point), of course, latkes. 2:30-4:30 p.m.
Chanukah Wonderland will overtake the Kentlands Shopping Center (206 Market St., Gaithersburg) will seven nights (or day) of fun, including cooking demos, story hour, puppet making and finally the arrival of the Menorah Fire Truck Parade (see below). Times vary; see website. Sirens will be blaring through the streets during the Chabad of Upper Montgomery County's Menorah Fire Truck Parade (leaving from Rockville Fire Station 3, 380 Hungerford Drive, Rockville, Md.). Making pit stops in Fallsgrove and Washingtonian Woods among other locations (see website), kids will score free Hanukkah gift bags. Live music and fire jugglers will also be making their way through the streets. The night caps off with a menorah lighting and Hanukkah party (at Chabad, 11520 Darnestown Road, Rockville, Md.). 6-8 p.m.; free.